So true are these words and especially for us- ‘The Indians’. Indian cinema has bestowed unparalleled exquisites on the masses. How much so ever we admire the B-town industry, it is always less. It has resulted in empowering us many a times. Be it making people aware of unknown facts or setting a trend and giving us the way for how do we carry our personalities. The entire credit goes to the complete team of each movie. Apart from all aspects of cinema world, one aspect goes hand in hand and that being the ‘Fashion’. Bollywood movies depict the Indian beauty and their attire perfectly. It without exception leaves a magical and mesmerizing effect on all. And amongst this are the Lehengas that Bollywood actresses have worn in the movies. These lehengas are just awe-inspiring. They have been created once and have gained utmost admirations. These unforgettable silhouettes are listed below. 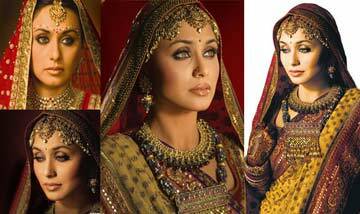 Aishwarya Rai Bachchan has perfectly reflected the Rajput women in the movie. All her costumes deserves a huge applauds. The credit goes to the designer Netta Lulla for creating such amazing and mesmerizing clothing. Aishwarya’s wedding lehenga in the movie is an exceptional high to the others that she has worn in the movie. And the look is here for you. 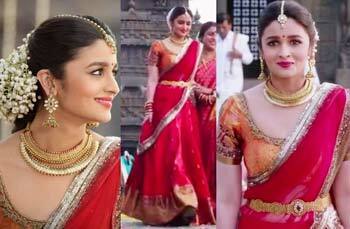 Adorable Alia Bhatt has worn an aesthetic lehenga in the movie Two States. Her lehenga is one of the best options for South Indians. It is different and simple and yet sophisticated. With great color combinations coupled with stunning jewelry, this lehenga deserves to be talked about. 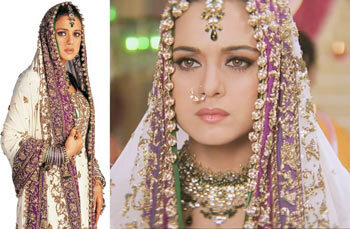 Her entire look in the movie was worth applauding, be it her wedding dress or formal kurtis that she has worn. Madhuri Dixit is a style icon. She looks beautiful in everything she wears. But her lehenga in Devdas is nothing less than fascinating. While the mirror work is in vogue, this lehenga should not be neglected and should be taken as a model to create beautiful staples. Sonam Kapoor has worn an all different and elegant lehenga in Dolly ki Doli movie. The color of the lehenga has added flare in the outfit. The staple has been beautifully delineated with Gotta. This is certainly an unmatchable and outstanding garment. Already acquiring cuteness and charm in her looks, this appealing lady had worn an alluring lehenga in the movie Veer Zaara. This white lehenga is delineated with Zardosi. The beauty of the lehenga lies in the crafting which has been done in minutia. This lehenga is just incredible. 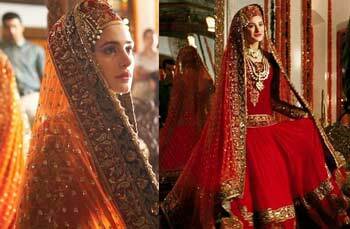 Portraying the Kashmiri look in her attire, Nargis Fakhri has garbed a beautiful red staple in Rockstar. Her lehenga is graceful and the midriff is designed in a way that glorifies the overall attire. The midriff in particularly has small and delicate motifs that makes the lehenga distinct in the lot. Hum Aapke Hain Kaun is an unforgettable movie of all times. 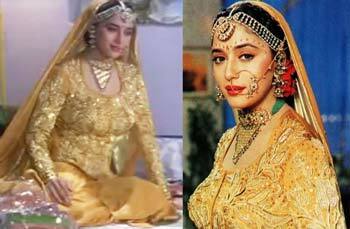 And another element of it that can’t be forgotten is the lehenga that Madhuri Dixit has worn in the movie in her wedding. The golden hued lehenga was designed with sequins and thread work. This lehenga was absolutely awe-inspiring. Paheli movie has showcased great apparels that were traditional and sophisticated. Amongst them was a lehenga that Rani Mukherjee garbed and looked absolutely astounding. The staple was coupled in great color combination. Also the lehenga was has small motifs that made it splendiferous. These were the lehengas that acquired place in my list. There must be many more good ones but these are unparallel. I hope many more are great lehengas are designed in the future and we enjoy the glory of our ever changing Bollywood.